I’ve started getting questions from advisors about FINRA’s new website provision, which was approved as an amendment Rule 2210 (Communications with the Public). 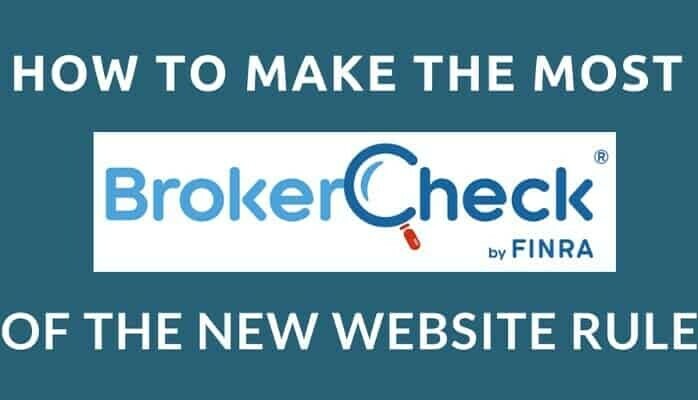 The new rule requires that you add a button to your website that links to FINRA’s BrokerCheck listing, which lists employment history, certifications, licenses, and violations. It seems a bit unfair that while the laws of FINRA forbid reviews or testimonials from clients, they require that each advisor features a record of complaints and disclosure events. But, as of June 6, 2016, each advisor must post a link to BrokerCheck front and center on their website. The new rule may be upsetting if you have disclosure events on your record you’d rather not share, but for most advisors it is a great marketing opportunity to call attention to their credentials, experience, and track record as well as remind their network that they work on a referral basis. What Does Rule 2210 Require? Regulatory Notice 15-50 explains that an advisor’s website must include a “readily apparent reference and hyperlink to BrokerCheck.” There are two options available, you can link to the BrokerCheck homepage, or you can link to your specific profile on the BrokerCheck site. The button or link needs to be “obvious” and “readily apparent.” Adding the link to the footer at the very bottom of your site is not considered “readily apparent” by FINRA. Their guidance suggests that they’ll require it “above the fold” of your website, where visitors can see it without scrolling. If you have an FMG Suite website (my recommended website provider), you won’t have to do anything. FMG Suite will be providing their clients with two different design options (one at the top of the site and one lower down on the page). However, if you have a different website vendor, you will need to make sure the link is added to your site before the deadline. This rule may be a headache for advisors with custom-built sites or who are not comfortable editing their own website. If you need help, I am happy to create a BrokerCheck button that matches the look and feel of your website and add it to your website. I’ll also provide a custom blog post to share the update with clients and make the most of this marketing opportunity. The change presents a great marketing opportunity for advisors who are proud of their record. I recommend reminding your clients and centers of influence at least once a year that you work on a referral basis. In this case, you can create a blog post that shares your BrokerCheck page and highlights your qualifications and credentials. Remind folks that if they have friends or family that you may be able to help, they should share your information with them. To learn more about the new rule, read the Regulatory Notice here and check with your broker dealer for specific guidance. If you need help send me an email to claire@indigomarketingagency.com or schedule a phone call with me! For more access to my exclusive Social Media expertise, click here to learn more about our Monthly Marketing Package and stay in touch by signing up for my weekly marketing newsletter. If you have any questions about how I can help you boost your online marketing, schedule a phone call with me here! Previous Post: « Take the 2016 Marketing Challenge!